Costa Blanca is a great place to venue your holiday. It has a lot to offer from beaches to their outdoor activities. 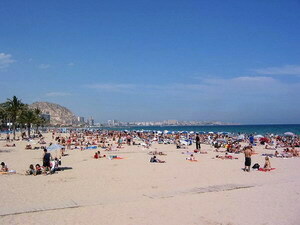 This article will provide you the best things to you holidays in Costa Blanca. They are all listed below. You might have always thought that you would have to buy expensive tickets to get a good seat in the bullring, but in the summer time, it is very popular here to bring the bulls out into the streets. The young lads who are or will be 18 years old make all the plans for this traditional show. They block off a series of streets and at the end of one of them, a makeshift corral to enclose the bulls is installed. The idea behind this is for the young lads to show how brave they are once they have become young men. Sounds prehistoric, doesn't it? On some occasions at night, rags, which have been soaked in petrol, are tied to the bulls horns and then lit up. The young fellows once again try to defy these brave bulls. Either starting from the north of the province and having flown into the Valencia airport in Manises or directly to the south, into the Altet airport in Alicante, your travel plans can be completed with no sweat. The Altet airport is only 10 kilometers from Alicante city, having incredible connections with other fantastic countries all over Europe like England, Ireland, Sweden, Denmark and Germany to just mention a few. For business traveler quality accommodations to hotels are certainly a very good choice. If you are looking for Hotels in Alicante for your next holiday, you may find many high quality ones especially along the Alicante coast to the north of the city. Most of these hotels offer all inclusive services and excellent restaurants. Here is our little recommendation list of very good Alicante Hotels: Melia Hotel Alicante, Tryp Gran Sol Hotel Alicante, Albahia Hotel Alicante and Sidi San Juan Alicante Hotel. Even though the Costa Blanca in Spain seems to take up a large extension of land, if you plan your days carefully, looking at exactly where you wish to visit on you first holiday on a good map, you can surely immerse yourself into the charming Costa Blanca rythym. This activity was is more or less like in Javea's past. In summer, the greater part of the local people goes to their country villa homes not far from the town centre where they harvest grapes. Harvesting grapes is a very long and hard process, using part of the muscatel grapes characteristic in this area for making raisins. The grapes, once they have been cut, are taken to the scolding bins where they go through a mixture of water and boiling saltwort which cracks the grapes skin so that they dry quicker. 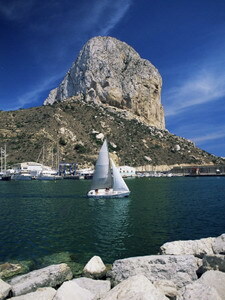 Javea was a great exporter and became internationally known, bringing an economical growth to this area. So in the market there are many products which now include raisins. Javea is found about 90 kilometres from Alicante and a little over 100 km. from Valencia city. Both of these cities have international airports which make travel very easy. When you look at the map of Spain, the highway A-7 connects Javea to the rest of Europe with exit ramps at Ondara no. 62 or at Benissa no. 63. Found near the landmark of the mountain peak Montgo, Javea is rich in natural landscapes, beautifully cared for beaches and a World Heritage history which has given Javea some of its most interesting cultural and traditional past times. Staying on one place for a holiday might be boring to a lot of travelers. You have to keep yourself moving, you can quickly move onto the seaside town of Moraira for a relaxing appetitive sitting right on the waterfront of the fishermen wharf, or continue down the coast to Calpe which is just before you reach Altea. Calpe has always attracted a large German and English population because its beaches were practically untouched and there were a lot of villa to be rented instead of staying in a hotel. Besides Costa Blanca has a lot of wonderful place to visits. But this has changed significantly, for the better, and now there are more accommodations, international restaurants and the typical ones in the port area which serve a delicious lobster stew called Caldereta or you can point your finger at the live fish or seafood you want and it is done right then and there. About the Author - Cheap holidays 24 is a UK based company that provides quality travel guides to tourist around the globe. In fact, there were already a lot of travels that were made easy because of the guides in cheap holidays 24. We also have a guide to your Holidays To Costa Blanca. You will surely have an intense holiday getaway.